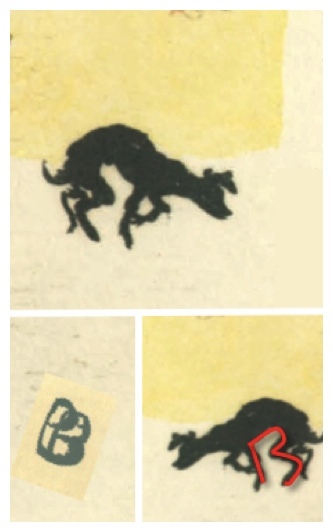 In a previous article, Bonnard's Salon des Cent (1896) we saw how the French artist indicates his self-representation in a dog by forming its legs into the shape of his own initials. 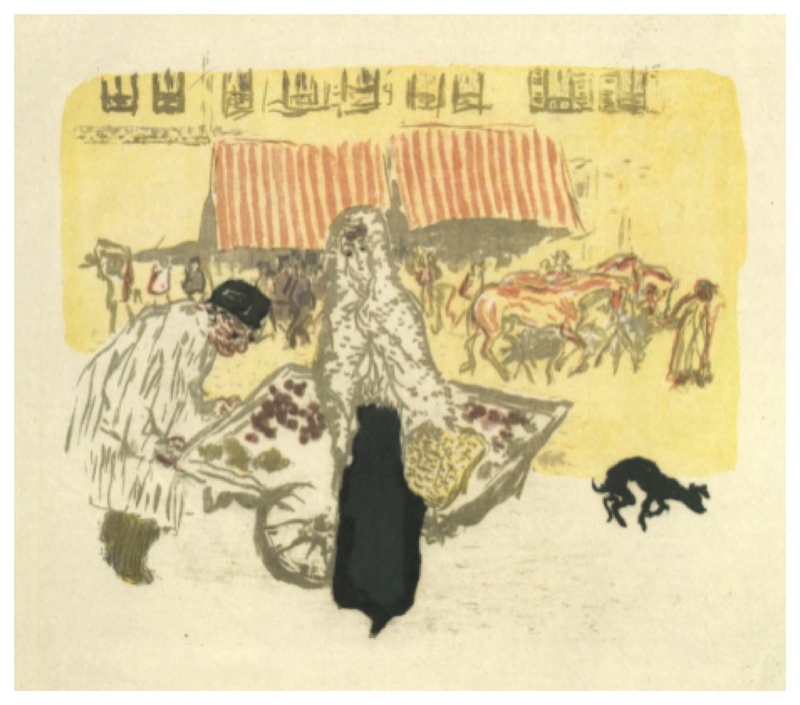 He did likewise in this contemporary lithograph, The Pushcart, which may look like a street scene in his beloved Paris but is instead, as I hope to show, a pathway through his own mind. Here's how. Bonnard, The Pushcart (c.1897) Color Lithograph from the suite Quelques Aspects de la vie de Paris, 1899. Metropolitan Museum, New York. The dog's front legs (top) resemble the letter P for Pierre with the paw bent at the ankle like the stem of the P in his monogram (lower left). The B for Bonnard is inverted into the rear legs. The hidden bi-directional "monogram" in the print suggests a mirror-reflection which is what this print is all about: both a reflection on the creative process and the inversion natural to printing. For me the cleverest detail is the way Bonnard has re-imagined drawing on a lithographic stone (see David Hockney at work, inset) into an old man pushing a cart. The trapezoid-shape of the cart resembles the lithographic stone as seen by an artist working close to its surface while the old man is really an imagination of Bonnard himself pushing his crayon forward across the surface of the very stone this lithograph was drawn on. 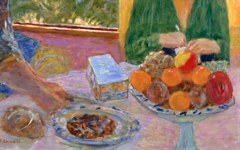 As a young man representing himself as an old one, Bonnard suggests that he, like other artists, conveys wisdom too. In art the elderly are wise. 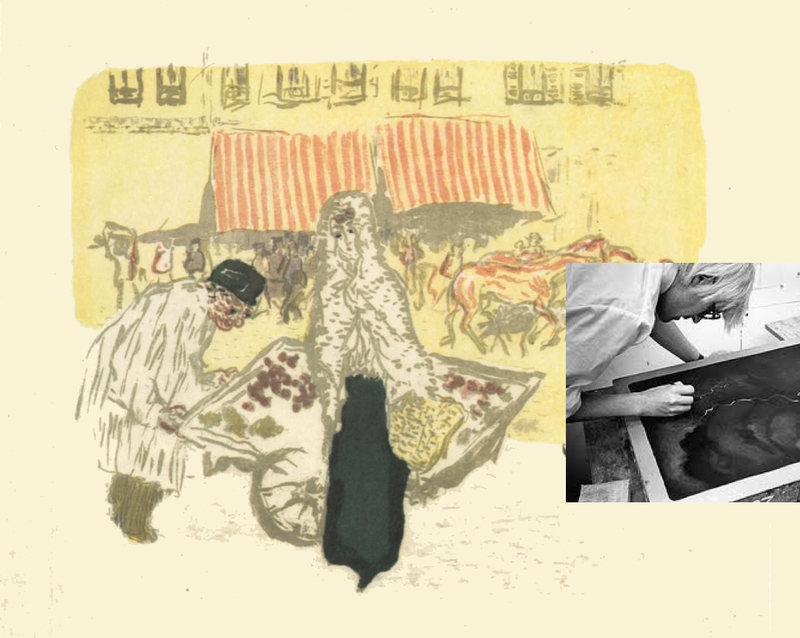 Bonnard's The Pushcart with inset photograph of David Hockney drawing on a lithographic stone (1973). Photo by Dan Freeman. 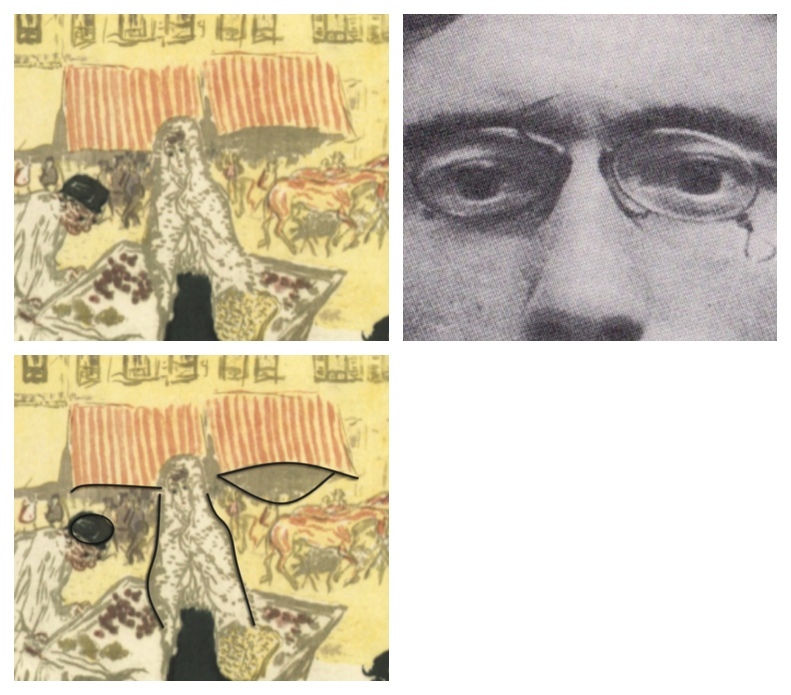 Now that we see the scene in a new way it may be easier to recognize that Bonnard, as was his custom, imposed his facial features as well.1 The lined awnings are his "eyelids" with oval forms underneath for his eyes. The man's black cap might even be a wayward "pupil" straying from his "eye" thereby linking the man's head (mind) with Bonnard's visual perception.2 The woman's torso is his obelisk-shaped "nose" with her head above and in between his eyes like Dante's Beatrice.3 Note too a "problem" in perspective: that even though the man is behind her she looks down at him as though he is in her sights. The two figures are "impossibly" linked. Such "inconsistencies" are not errors but hints that these scenes are not natural images but mental ones. 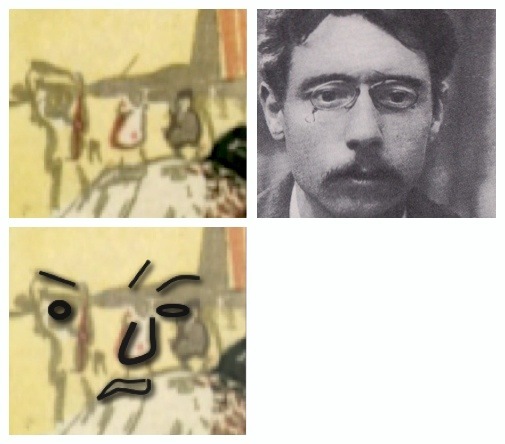 Mental images, according to both Mozart and Beethoven no less, contain multiple views of the same form so it is, perhaps, not surprising that Bonnard's "face" appears a second time in the background 4. Again we see, at left, his obelisk-shaped nose and lines to represent his eyebrows and eyes with at least one of them a window. Bonnard, like so many great artists before and since, has turned the mental and physical process involved in making the composition into a scene in the city where he lives, an allegory of his creative life. 1. Art historians are, as far as I know, completely unaware that Bonnard's features appear in, I would estimate, nearly every image he created. Of the many I have inspected he appears in at least nine out of ten. 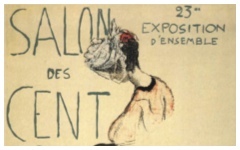 Other examples already published on EPPH are Bonnard's Woman with a Umbrella (1895), Salon des Cent (1896) and After the Bath (1910). 2. If you squint while looking at the print or stand further away, the black cap can be seen as the "pupil" of Bonnard's "eye" even though it seems, on close inspection, to have dropped out of it. 3. The woman's head, above and in between Bonnard's "eyes", is located in the spot where Renaissance artists would indicate an "inner eye" within the mind. 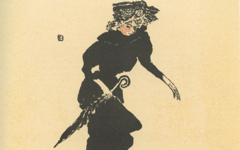 Bonnard did something similar in a contemporaneous print Woman with an Umbrella (1895). He located the circular handle of an umbrella representing his "inner eye" above his real ones. 4. Major artists and others have access to levels of their mind that we, less sensitive types, are rarely, if ever, aware of. We have thoughts which we then perceive in words, music, or images; they can visualize the thought process itself before thoughts become words, music or images. Mozart said that on completing a long composition he could: "survey it, like a fine picture or beautiful statue, at a glance. Nor do I hear in my imagination the parts successively, but I hear them, as it were, all at once." Mozart's comparison of a mental image to a work of art that can be seen from all sides simultaneously must be accurate because Beethoven described his thought in similar terms: "...In my head, I begin to elaborate the work in its breadth, its narrowness, its height, and its depth, and as I am aware of what I want to do, the underlying idea never deserts me. It rides, it grows up. I hear and see the image in front of me from every angle, as if it had been cast..." [italics added]. For more on mental images, see blog entry Cubism Explained (30 Oct. 2011). “Mozart: A Letter” in Brewster Ghiselin, The Creative Process (New York: The New American Library) 1952, p.45; Beethoven: Letters, Journals and Conversations, ed. M. Hamburger (New York: Pantheon Books) 1952, p. 195, cited in Albert Rothenberg, “Homospatial Thinking in Creativity”, Archives of General Psychiatry 33, 1976, p.20. Original Publication Date on EPPH: 09 Jul 2013. © Simon Abrahams. Articles on this site are the copyright of Simon Abrahams. To use copyrighted material in print or other media for purposes beyond 'fair use', you must obtain permission from the copyright owner. Websites may link to this page without permission (please do) but may not reproduce the material on their own site without crediting Simon Abrahams and EPPH.